This solitaire ranges from southern Alaska, British Columbia and Alberta south to northern Zacatecas in Mexico, preferring montane woodlands. During winter, it may move in search of food to lower elevations, including the Great Plains, northern interior Mexico, and even desert oases. Townsend's solitaire reaches a length of approximately 8–9.5 inches (20–24 cm) and wingspan of 14.5 in (37 cm); it weighs approximately 1.2 oz (34 g). 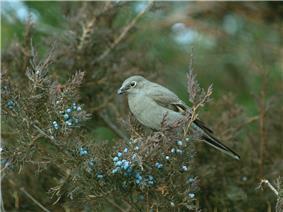 It has a short, thick, blackish bill; a white eye ring; and gray plumage with a buffy wing stripe and edges of the flight feathers. The tail is long, tapered when shut, and edged with white. Juveniles are mottled gray and white. The nest resembles that of other solitaires: a cup of fine plant material on or close to the ground. Townsend's solitaire usually lays three or four eggs that are grayish-white with brown dots or splotches concentrated at the larger end. ^ a b c d e Howell, Steve N. G.; Webb, Sophie (1995). A Guide to the Birds of Mexico and Northern Central America. Oxford University Press. p. 583. 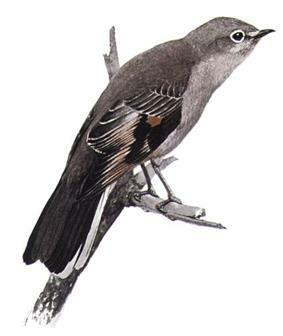 ^ a b c d e f g "Myadestes townsendi"Townsend's Solitaire . eNature.com Nature Guides. 2005. Retrieved 2007-08-17.